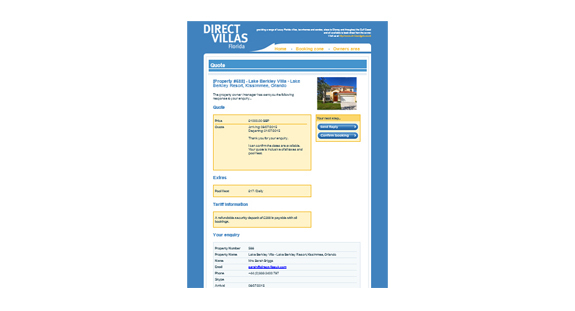 Here at Direct Villas Florida we appreciate that time is of the essence for Florida villa owners and managers alike, and in line with this we provide our customers with a simple and efficient way in which to respond to those all important enquiries. The following is a simple guide on how to use our response system. 1. SAVES YOU TIME. First and foremost – it’s a quick and easy method saving you time copying and pasting details from the original enquiry. 2. GIVES THE GUEST EXTRA CONFIDENCE. The professional branded template gives the prospective guest extra confidence to go on and confirm their booking with you, as they will identify with the branding already seen on the site searches. 3. IT HELPS YOUR PROSPECTIVE GUEST. Your branded replies include your own property name, ID number and image which links back to your listing page – helping the renter identify quickly which property and owner has responded to them and saving you the job of confirming all your listing details again. 4. REPLY MORE LIKELY TO GET SEEN. The branded reply will show as being delivered from a ‘directvillasuk.com’ email address. This email address should already be in the holidaymakers address book, as they will have already received an automatic confirmation to acknowledge their contact to a particular property. If you reply from your own email client, your address will be previously unknown to them and may sit unseen and unread in their ‘junk’ folder. 5. QUOTE SHOWS ANY ASSOCIATED COSTS IN YOUR TARIFF NOTES. When supplying a quote in the first instance, the ‘Send Quote’ option allows you to highlight your individual quote, but will also include details of ‘Extras’, or ‘Additional Information’ about your tariffs’ that you’ve included in your original listing. E.g. ‘All quotes are fully inclusive of all local taxes. A deposit of 10% of the total cost is due within 2 weeks of a booking being made. This ensures that the prospective renter is fully aware of not only the availability of the various extra services which you provide, but the associated costs too. An ideal opportunity for up-selling your extras. 6. INCLUDES A CALL TO ACTION. The response templates includes a ‘Confirm Booking’ option for the holidaymaker to reply to you – a call to action that helps you close the deal! 7. HELPS YOU KEEP TRACK OF RESPONSES. Using the built in response system helps you manage and record your enquires, quotes, responses and bookings within the Owners Area. By default your enquiry section shows ‘New Enquiries’ not responded to using the site system, so you can see at a glance any new leads that still require an answer. 8. PROVIDES A WRITTEN RECORD. The correspondence between you, the owner and the prospective renter is recorded for your information. These are date stamped, showing when the communication was made, which could be useful at a later date in the event of any queries raised by either the owner or renter. Click on the page icon in the ‘View’ column to see the enquiry details and thread of conversation. 9. OPTION TO ADD YOUR OWN NOTES. At any stage of the transaction, you can view enquiry details within the Owner’s Area and add your own notes. Select the enquiry field within the Owner’s Area, click the ‘view’ link on any of your existing enquiries, and scroll down to the ‘My Notes’ section. For example you could add notes reminding you of a phone conversation or whether deposit received. There is also the option to change the status of an enquiry in this section. So if for example you’ve called and given a verbal quote, you can change the status to ‘Quote Sent’ transferring it to the relevant folder. 10. REASSURES YOUR GUEST. 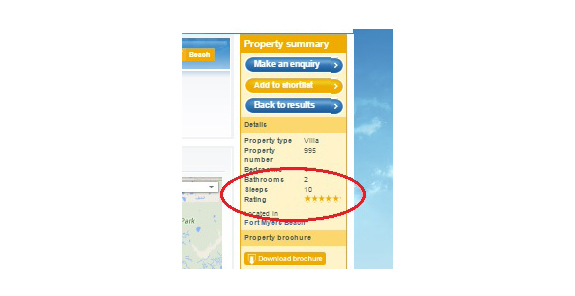 The confirmed booking also shows in your guest’s Booking Zone – again giving them extra confidence that their booking with you is genuine and secure. 11. HELPS YOU TO GET DIRECT REVIEWS AND STAR RATINGS. 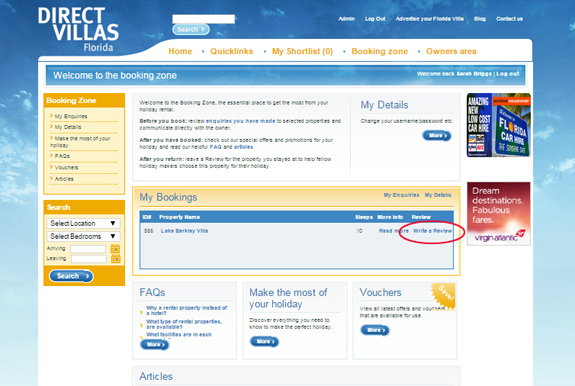 Recording the confirmed booking adds a ‘Write a Review’ link in your guests Booking Zone. We’ll even send them an automatic reminder on their return, inviting them to add a direct review and star rating for your property. 12. KEEP TRACK OF CONFIRMED BOOKINGS AND REVENUE. 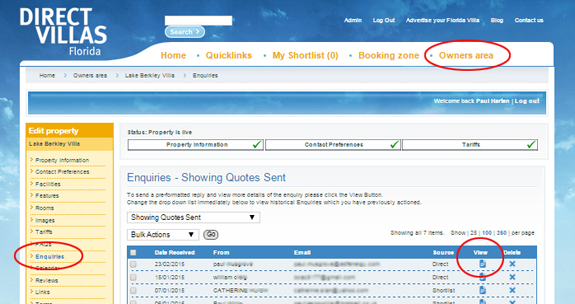 Using the confirmed button response transfers details of the enquiry to your ‘Confirmed Bookings’ folder. At any time you can see at a glance what the advert has generated for you. This entry was posted on Friday, July 10th, 2015 at 9:00 am	and is filed under Florida rental owners, Florida villa owners, Marketing your Florida villa, Uncategorized. You can follow any responses to this entry through the RSS 2.0 feed. You can leave a response, or trackback from your own site.